It's 40 years since Meat Loaf's rock-operatic behemoth became a pop cultural phenomenon. And it's still going strong, with Bat Out Of Hell : The Musical having just opened in London. 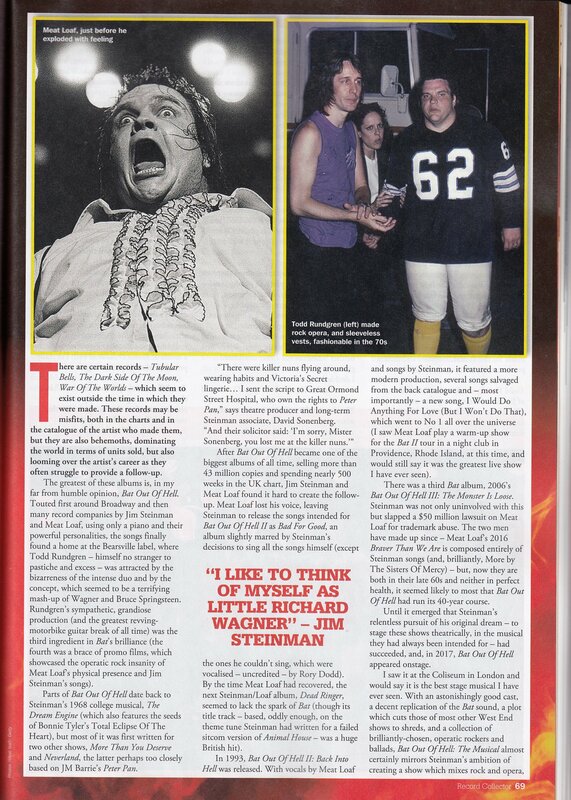 David Quantick speaks to Bat mastermind Jim Steinman, producer Todd Rundgren and musical coordinator David Sonenberg about the enduring fascination with BOOH. There are certain records - Tubular Bells, The Dark Side Of The Moon, War Of The Worlds - which seem to exist outside the time in which they were made. These records may be misfits, both in the charts and in the catalogue of the artists who made them, but they are behemoths, dominating the world in terms of units sold, but also looming over the artist's career as they often struggle to provide a follow-up. The greatest of these albums is, in my far from humble opinion, Bat Out Of Hell. Touted first around Broadway and then many record companies by Jim Steinman and Meat Loaf, using only a piano and their powerful personalities, the songs finally found a home at the Bearsville label, where Todd Rundgren - himself no stranger to pastiche and excess - was attracted the the bizarreness of the intense duo and by the concept, which seemed to be a terrifying mash-up of Wagner and Bruce Springsteen. Rundgren's sympathetic, grandiose production (and the greatest revving-motorbike guitar break of all time) was the third ingredient on Bat's brilliance (the fourth was a brace of promo films, which showcased the operatic rock insanity of Meat Loaf's physical presence and Jim Steinman's songs). Parts of Bat Out Of Hell date back to Steinman's 1968 college musical, The Dream Engine (which also features the seeds of Bonnie Tyler's Total Eclipse Of The Heart), but most of it was written for two other shows, More Than You Deserve and Neverland, the latter perhaps too closely based on J.M. Barrie's Peter Pan. "There were killer nuns flying around, wearing habits and Victoria's Secret lingerie… I sent the script to Great Ormond Street Hospital, who own the rights to Peter Pan", says theatre producer and long-term Steinman associate David Sonenberg. "And their solicitor said: ‘I'm sorry, Mister Sonenberg, you lost me at the killer nuns.’"
After Bat Out Of Hell became one of the biggest albums of all time, selling more than 43 million copies and spending nearly 500 weeks in the UK chart, Jim Steinman and Meat Loaf found it hard to create the follow-up. Meat Loaf lost his voice, leaving Steinman to release the songs intended for Bat Out Of Hell II as Bad For Good, an album slightly marred by Steinman's decision to sing all the songs himself (except the ones he couldn't sing, which were vocalised - uncredited - by Rory Dodd). By next time Meat Loaf had recovered, the next Steinman / Loaf album, Dead Ringer, seemed to lack the spark of Bat (though its title track - based, oddly enough, on the theme tune Steinman had written for a failed sitcom version of Animal House - was a huge British hit). In 1993, Bat Out Of Hell II : Back Into Hell was released. With vocals by Meat Loaf and songs by Jim Steinman, it featured a more modern production, several songs salvaged from the back catalogue and - most importantly - a new somg, I Would Do Anything For Love (But I Won't Do That), which went to No. 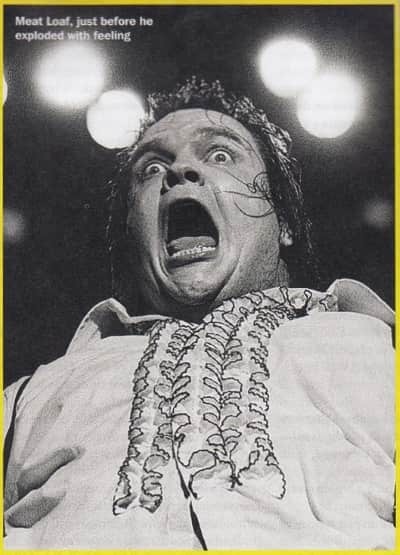 1 all over the universe (I saw Meat Loaf play a warm-up show for the Bat II tour in a night club in Providence, Rhode Island, at this time and would still say it was the greatest live show I have ever seen). 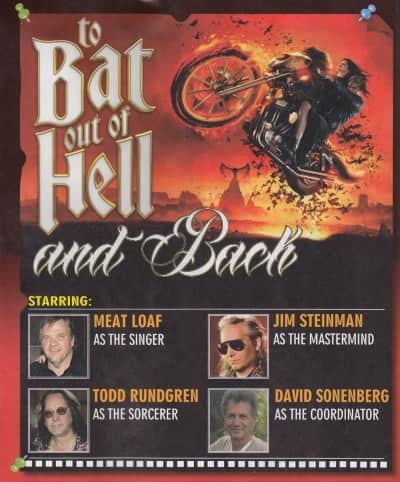 There was a third Bat album, 2006's Bat Out Of Hell III : The Monster Is Loose, Steinman was not only uninvolved with this but slapped a $50 million lawsuit on Meat Loaf for trademark abuse. The two men have made up since - Meat Loaf's 2016 Braver Than We Are is composed entirely of Steinman songs (and, brilliantly, More by The Sisters Of Mercy) - but now they are both in their late 60s and neither in perfect health, it seemed likely to most that Bat Out Of Hell had run its 40-year course. 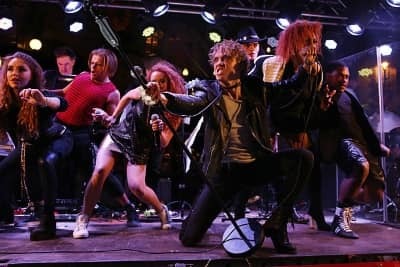 Until it emerged that Steinman's relentless pursuit of his original dream - to stage these shows theatrically, in the musical they had always been intended for - had succeeded, and, in 2017, Bat Out Of Hell appeared onstage. I saw it at the Coliseum in London and would say it is the best stage musical I have ever seen. 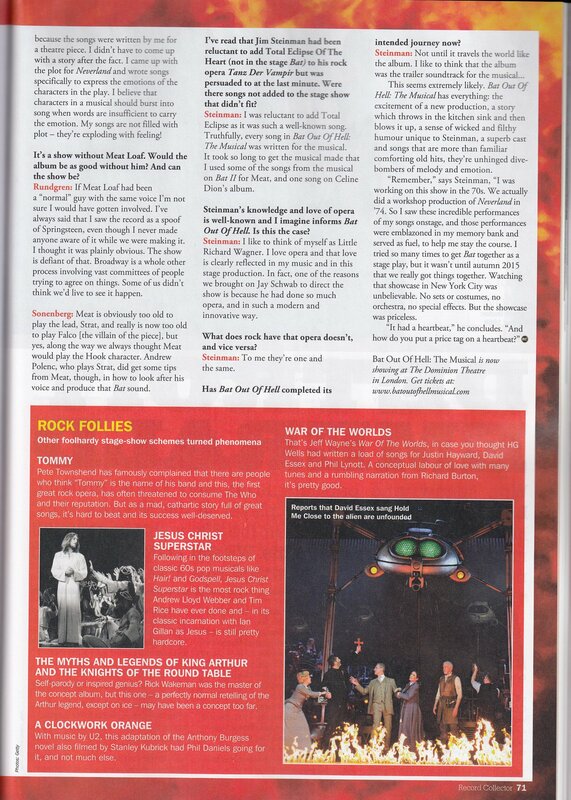 With an astonishingly good cast, a decent replication of the Bat sound, a plot which cuts those of most other West End shows to shreds, and a collection of brilliantly-chosen, operatic rockers and ballads, Bat Out Of Hell : The Musical almost certainly mirrors Steinman's ambition of creating a show which mixes rock and opera, humour, and, above all intense emotion. It has won awards, deservedly so, and is selling tickets by the shedload. I spoke to Jim Steinman, David Sonenberg (who has been involved with Jim Steinman's theatrical career from the beginning), and original Bat producer Todd Rundgren about the straordinary 40-year run of the most over-the-top musical hit of all time. Todd Rundgren once called Bat Out Of Hell "an imaginary musical that never got produced". Did you ever think it would be produced? David Sonenberg: I always thought it would be a musical. As to how hard it was to get this to the stage… the fact that it took 40 years should give you a good indication. To be honest, when we tried to get Bat Out Of Hell to market back in the 70s, record companies didn't want it, and felt it was too theatrical. And when we tried to market the music for the theatre, investors and theatre producers felt it was too rock 'n' roll. Todd Rundgren: Bat grew out of the ashes of Jim Steinman's attempts to mount a broadway musical. Though the record didn't have a storyline, many of the song themes came from Neverland, the idea of the Lost Bad Boys rebelling against the older generation. Parts of this show date back many years - some even appeared first in The Dream Engine. Is Bat Out Of Hell Jim Steinman's magnum opus? Jim Steinman: I was writing Neverland while we were performing The Dream Engine. 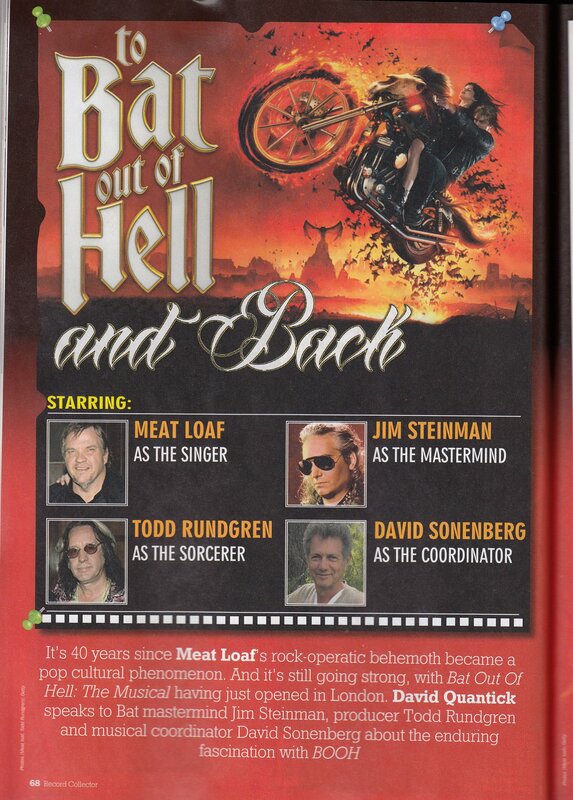 It was a crazy, exciting time and that period sowed the seeds for Bat Out Of Hell. So yes, Bat is my magnum opus. And it goes well with just about anything. Can you think of any other show that has taken so long from pitch to production? Sonenberg: Honestly, I can't think of a musical with a longer gestation period. After Bat scored such a big success, there were lots of people interested in making a film version, but no-one was interested in it as a theatre piece. But neither Steinman nor I ever considered giving up the dream, and ultimately I decided to produce the musical and Jim wrote the book. The music of Jim Steinman is emotional, witty, and never knowingly underpowered. Do these attributes translate to Bat onstage? Steinman: I tried to be unwitty, unemotional and underwhelming, but I don't seem to have the knack. What we put onstage reflects the essential DNA of my music and lyrics. Rundgren: Steinman's songs always had a theatrical backdrop. During the early shows Jim would assume a persona with the white gloves and everything. There was no chatting with the audience or other sorts of non-theatrical interactions. After Jim left, the shows became a bit less strict, maybe more like a rock show. Bat Out Of Hell has always had as much in common with Rocky Horror's version of musical theatre as it does with Bruce Springsteen's version of rock. Does Bat balance between two things? Is it truly rock or truly Broadway? Sonenberg: You're quite correct referencing Rocky Horror and Bruce Springsteen. 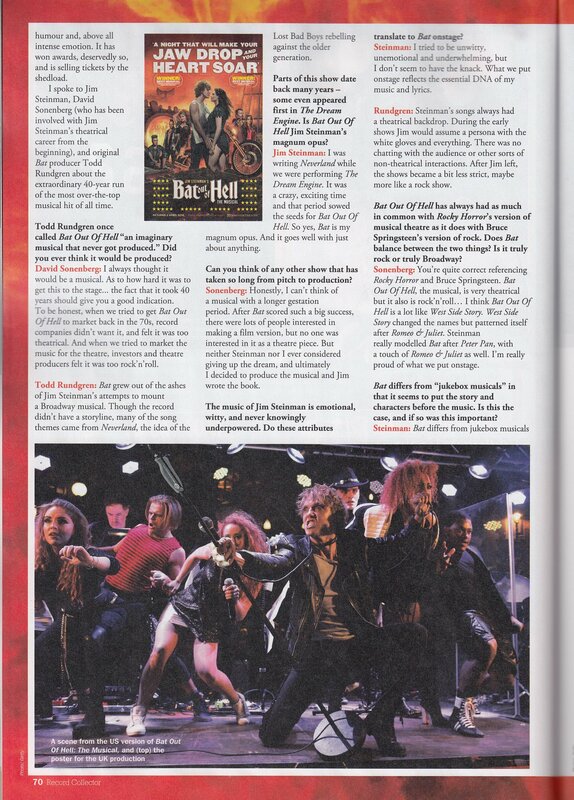 Bat Out Of Hell, the musical, is very theatrical but it also is rock'n'roll… I think Bat Out Of Hell is a lot like West Side Story. West Side Story changed the names but patterned itself after Romeo & Juliet. Steinman really modelled Bat after Peter Pan, with a touch of Romeo & Juliet as well. I'm really proud of what we put onstage. Bat differs from "jukebox musicals" in that it seems to put the story and characters before the music. Is this the case, and if so was this important? Steinman: The songs were written by me for a theatre piece. I didn't have to come up with a story after the fact. I came up with the plot for Neverland and wrote songs specifically to express the emotions of the characters in the play. I believe that characters in a musical should burst into song when words are insufficient to carry the emotion. My songs are not filled with plot - they're exploding with feeling! It's a show without Meat Loaf. Would the album be as good without him? And can the show be? 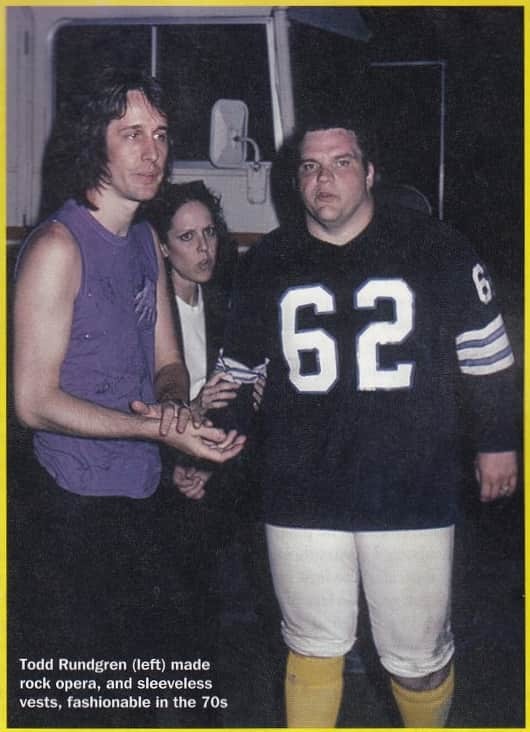 Rundgren: If Meat Loaf had been a "normal" guy with the same voice, I'm not sure I would have gotten involved. I've always said that I saw the record as a spoof of Springsteen, even though I never made anyone aware of it while we were making it. I thought it was plainly obvious. The show is defiant of that. Broadway is a whole other process involving vast communities of people trying to agree on things. Some of us didn't think we'd live to see it happen. Sonenberg: Meat is obviously too old to play the lead, Strat, and really is too old now to play Falco [the villain of the piece], but yes, along the way we thought meat would play the Hook character. Andrew Polec, who plays Strat, did get some tips from Meat, though, in how to look after his voice and produce that Bat sound. I've read that Jim Steinman had been reluctant to add Total Eclipse Of The Heart (not in the stage Bat) to his rock opera Tanz Der Vampire but was persuaded to at the last minute. Were there songs not added to the stage show that didn't fit? Steinman:I was reluctant to add Total Eclipse as it was such a well known song. Truthfully, every song in Bat Out Of Hell : The Musical was written for the musical. It took so long to get the musical made that I used some of the songs from the musical on Bat II for Meat, and one song on Celine Dion's album. Steinman's knowledge and love of opera is well-known and I imagine informs Bat Out Of Hell. Is this the case? Steinman: I like to think of myself as Little Richard Wagner. I love opera and that love is clearly reflected in my music and in this stage production. In fact, one of the reasons we brought on Jay Scheib to direct the show is because he had done so much opera, and in such a modern and innovative way. What does rock have that opera doesn't, and vice versa? Steinman: To me they're one and the same. Has Bat Out Of Hell completed its intended journey now? This seems extremely likely. Bat Out Of Hell : The Musical has everything: the excitement of a new production, a story which throws in the kitchen sink and then blows it up, a sense of wicked and filthy humour unique to Steinman, a superb cast and songs that are more than familiar comforting old hits, they're unhinged dive-bombers of melody and emotion. "Remember", says Steinman, "I was working on this show in the 70s. We actually did a workshop production of Neverland in '74. So I saw these incredible performances of my songs onstage, and those performances were emblazoned in my memory bank and served as fuel, to help me stay the course. I tried so many times to get Bat together as a stage play, but it wasn't until autumn 2015 that we really got things together. Watching that showcase in New York City was unbelievable. No sets or costumes, no orchestra, nospecial effects. But the showcase was priceless. "It had a heartbeat", he concludes. "And how do you put a price tag on a heartbeat?" Original magazine scans: Page 1, Page 2, Page 3, Page 4.